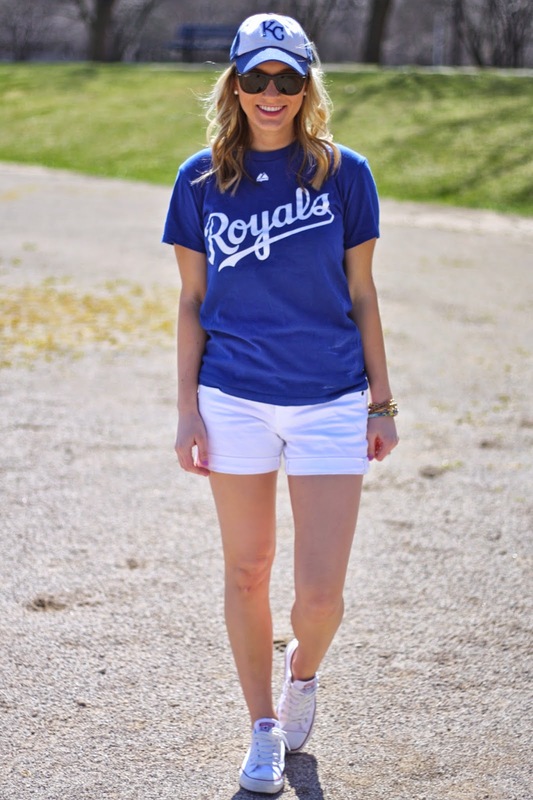 Friday is here and that means another guest post for the "What to Wear to a Baseball Game" series! Today, Mary-Katherine from gold-hatted lover is sporting her two favorite looks for the Royals. She's totally covered the bases for two awesome looks for a game. So glad to have her on the blog today-- thanks for guest posting MK! Be sure to check out her blog here! An MLB team located in Kansas City, MO and members of the American League Central division. Since 1973 they have played home games in Kauffman Stadium and their colors are royal blue, white and powder blue. They've played for two World Series titles, winning their only one in 1985.
it is baseball season and to me royals games are synonymous with summer, my absolute favorite season. i have so many memories of warm nights at the k spent cheering on our boys with my main man. when i say warm nights i really do mean warm. one thing this california girl found out very quickly is that humidity means it does not cool down when the sun goes down! ever since that discovery i make sure to wear loose pieces and of course sunglasses or a hat to keep from getting a major burn (more lessons learned). while i am typically not one to wear sports gear but rather choose to rock team colors like in outfit one, i do get a hard time for it so every once in a while i will throw on the team gear to show my support and hush the haters ;) since i do tend to share my time between these two sorts of outfits i thought i may as well share them both! 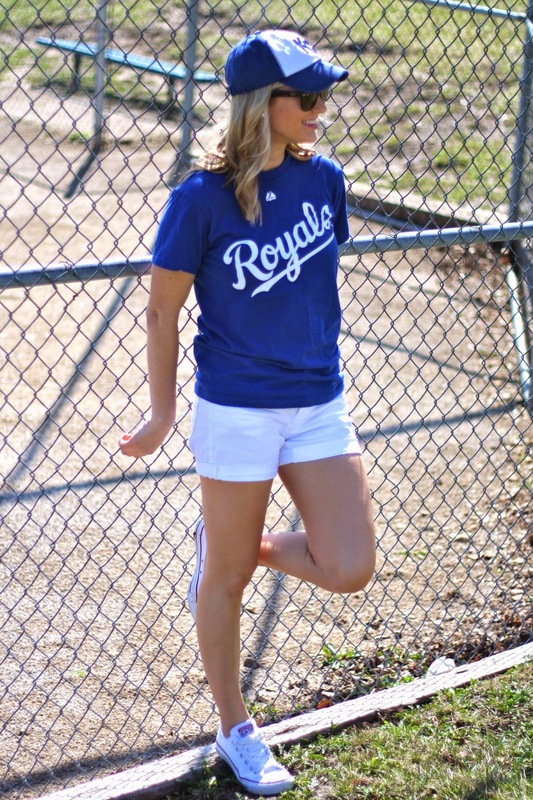 wishing you a wonderful summer rooting on your favorite team and remember: be royal! look one// top: old navy (comes in five colors!) // skirt: j.crew factory // sandals: jack rogers // sunglasses: tory burch // necklace: nordstrom, old (love this one) // bracelets: j.crew + thrifted // nails: essie "my better half"
look two// top: royals // shorts: j.crew factory // sneaks: converse // sunglasses: ray-ban // bracelets: c/o socal gems + j.crew // nails: essie "my better half"
thanks so much for having me! loving this series! 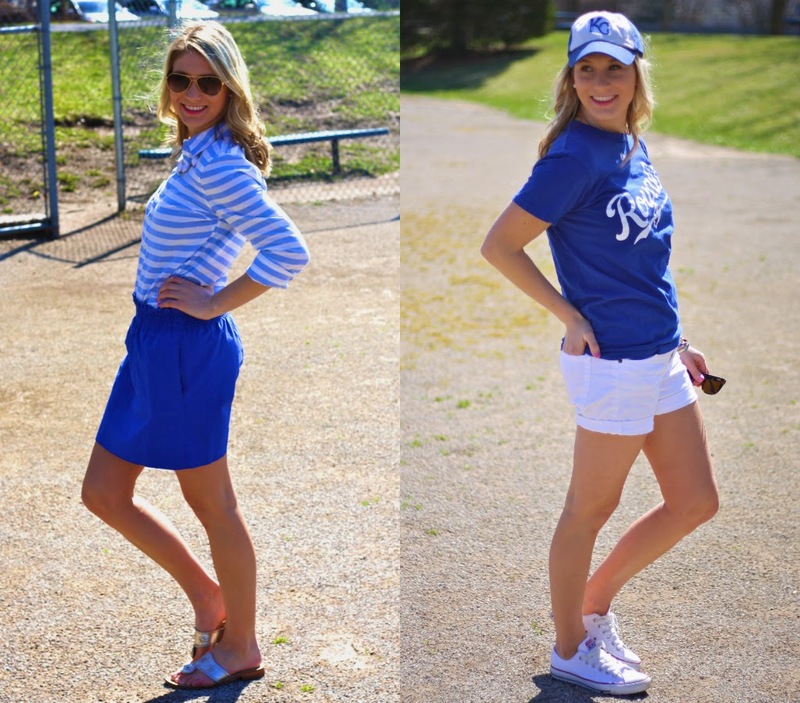 Love the Royals & love these cute outfits MK put together!